I must be crazy making a bean soup on such a hot day. Oh well that’s what central A/C is for. This is a real comforting soup that would be great all by itself or with some good crusty bread. I was going to make this in the crock pot but decided to do it on the stove. I like having more control when cooking beans. 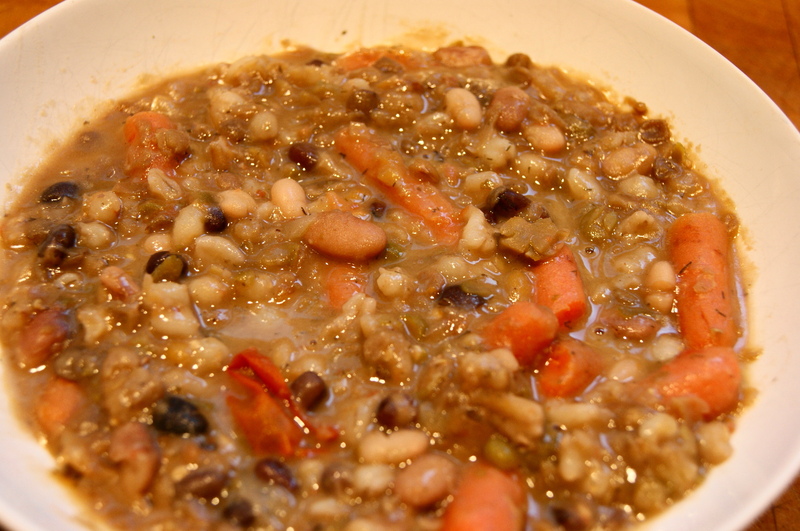 In a large stock pot combine the water and beans. In a skillet heat the olive oil and add the onion and tomatoes, season with the Mediterranean seasoning to taste. Cook until the tomatoes begin to breakdown then add to the soup. Add the ham hocks to the skillet and brown on all sides then transfer to the soup. Heat the soup at high temperature until it reaches boil. Turn the heat down to simmer, cover and cook for about ½ hour then add the carrots. Continue to cook, check the soup often until you get the texture you like. Season the soup with Mediterranean seasoning and salt to taste. Remove the ham hocks and take any meat from them. Chop the meat into small pieces and return the meat to the soup.